I haven’t been to Walgreens to shop in a while, so I ventured over this week. I reviewed at my Examiner column. Check it out — Register Rewards and coupons. Share your frugal tips with my three hostesses and me this week! Add your blog post to the linky. Your one post will show up on the four hostess websites — juliecache, plus Frugal Playground, Confessions of a Frugal Mind, and Learning the Frugal Life. Please link back to this post so your readers can enjoy the linky, too. Make sure your post was published within the last seven days. And use your permalink — read here for information on permalinks. Our linky is open until Friday night. If you are linking up, be courteous and link back to this hostess page by copying and pasting the following text in your post, or you can copy (Control-A, Control-C) and paste (Control-V) the code in the box to place our blog hop button anywhere on your blog. 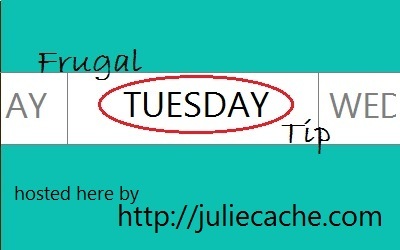 This entry was posted in frugal family and tagged frugal tuesday tip. Bookmark the permalink.